One of my big gripes wih the modern stoner scene is that a lot of people don't seem to understand the fundamental power of 60's style freakouts. Not a lot of people are willing to just embrace the raw volume and keyboard driven madness that defined so many of our favorite bands from that era. At the end of the day it's the fact that a lot of these new guys don't even listen to Hawkwind that gets me. 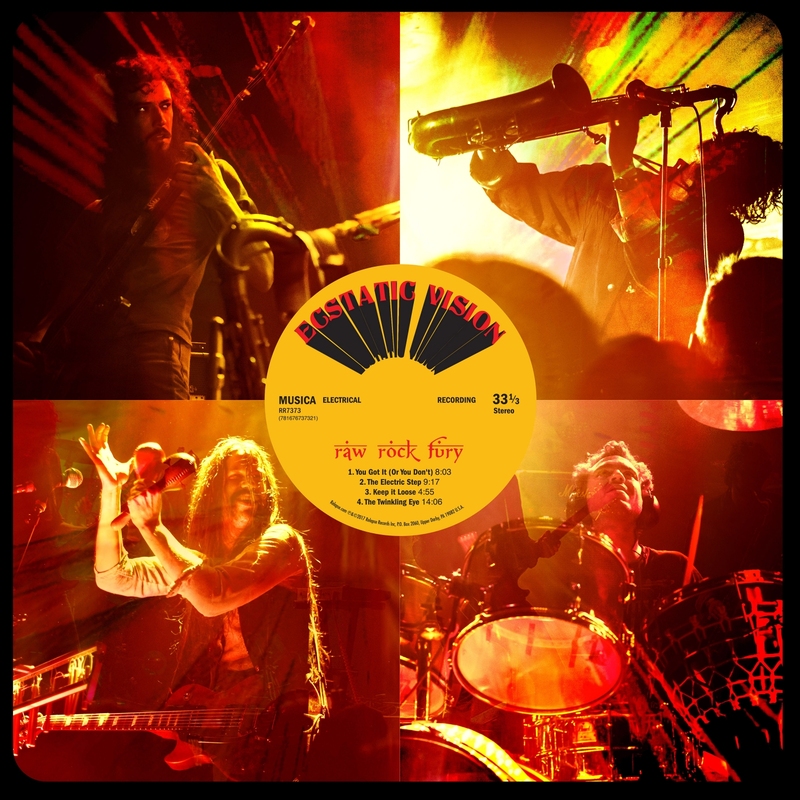 That's where Ecstatic Vision come in, as Raw Rock Fury proves, these guys are not only super into Hawkwind, but also the MC5 and Aphrodite's Child. In other words - this is the sort of rock and roll that makes an old gaffer fall in love. I think the thing that really gets me about this band is their willingness to bring in just about every instrument under the sun. It's the fact that the bands charismatic frontman, Doug Sabolik is rattling maraccas on the album cover. It's the fact that they have a liberal use of the saxophone. Hell it's the fact that they are utterly dedicated to using weird effects on just about every track and that they use them well. Ecstatic Vision are a band who have exactly that - an ecstatic vision that implies a certain joie de vivre and a complete willingness to chill out and experiment with no end of bizarre orchestrations and unique arrangements. It's rare these days that you find people who are totally willing to kick out the jams and let the rock and roll magic of the age wash over them. Ecstatic Vision put together the sort of sounds that let freaks like me chill out and find a new path forward. They have never been limited by the inherent shitiness of their age or the incredible human suffering represented by this music. Raw Rock Fury is a masterpiece, a record that reminds us all why we can't help but to fall in love with the joyful noise we call rock and roll.